Wireless earbuds using Kleer are able to transmit sound in a manner that is light years beyond what you can hear when you listen to Bluetooth enabled earbuds. The only downside is the cost. Compared to Bluetooth there are relatively few Kleer devices. The prices may come down as more products are produced with this technology but for now good wireless music listening comes at a steep price. Let’s review a few different models to get an idea of what is available. Sleek SA6 and the W-1 Wireless Bundle Kit Unfortunately these are no longer being offered for sale. Unfortunately these are no longer being offered for sale. This system is a great set of earbuds that are paired with an elegant and simple wireless receiver. They are also designed to be flexible in their use, so they can also be plugged into an mp3 player if you ever prefer switching between wires and wireless. The earbuds provided with this setup are well reviewed and have good sound quality. 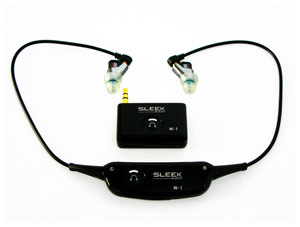 The wireless receiver, which is the part that makes this the wireless bundle kit, is made to be tethered to both earbuds and hang behind the head. This would preclude do anything strenuous in terms of exercise while wearing these but besides that limitation the Kleer wireless system that Sleek Audio has put together is a great set of wireless earphones. These will set you back around $250. The Sleek Audio wireless earbud package includes a set of nice earbuds, a Kleer wireless receiver and a transmitter that can be plugged into your headphone jack on your mp3 player. 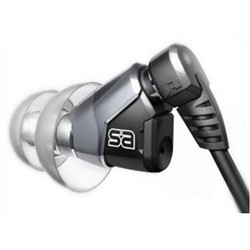 The SA6 earbuds offer some nice sound reporoduction, matching up well with the quality Kleer transmission they are capable of receiving. What is it about using W1 in the model name when it comes to wireless earbuds? Despite having to share a model number with Sleek Audio’s product these Sennheiser’s are the cream of the crop. 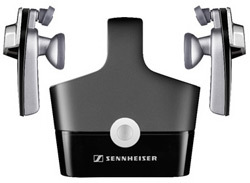 Using Kleer wireless technology and the spare no expense design has led to Sennheiser producing a nice product. One of its unique features is a totally untethered pair of earphones. Since there is no central receiver each earphone must have a receiver built into it. This leads to what is one of the few complaints about this product. Some people do have a bit of a difficult time getting the earbuds to fit well and, since they are relatively bulky, they do not stay in their ears all that well. Yet there are many people do not have such problems, get a great fit and really enjoy them. The only drawback for many folks is the price. They generally sell for somewhere between $400 and $500 dollars. 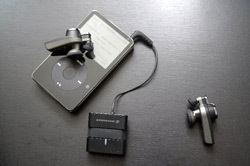 An iPod, Kleer transmitter and the Sennheiser wireless earbuds. The only other manufacturer of Kleer wireless is DigiFi. They offer two different models of wireless earbuds but these are not readily available in the US. At the moment they are only marketed and sold in Europe.